Decorating and celebrating for the 4th of July is one of my favorite things! One of the easiest things to change for holidays, is what’s on your door! This is the first thing people see when they walk into your home and so you want to make it fun and welcoming. 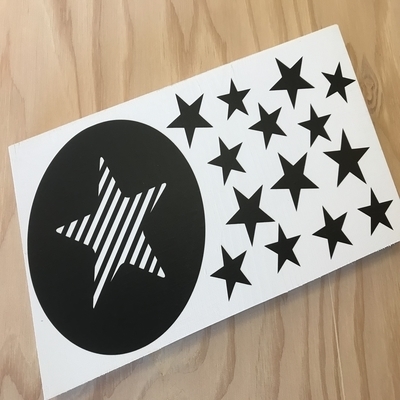 If you are like some people and want all the work taken out of creating projects like this, you can join my CRAFT CLUB where you get the kit of the month for only $25! It includes everything you need to make the kit as shown! It doesn’t get much easier than that ladies! Hop over HERE to find out more!! 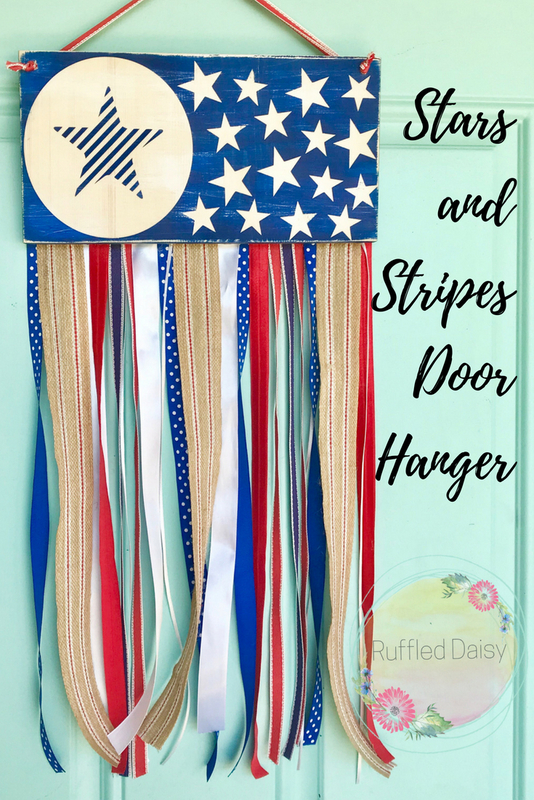 Creating this Stars and Stripes Door Hanger is easy and can be done in less than 30 minutes! 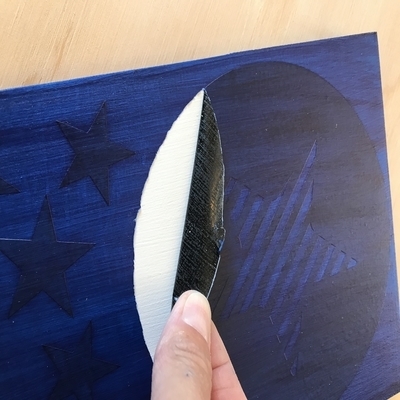 You need a scrap piece of wood, white and blue paint, a stencil of any kind (I use vinyl since I have a vinyl cutter) and varying colors and styles of ribbon! Drill two small holes into the top corners of the scrap wood. This is where you will tie the ribbon that hangs. Next, paint your wood white. When it is dry you will apply the stencil then paint over your stencil with blue paint. Let dry and then remove vinyl. 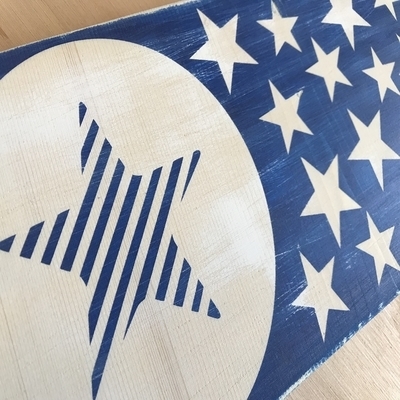 At this point, you can sand down the top of your board to give it a distressed look. This is purely personal preference. 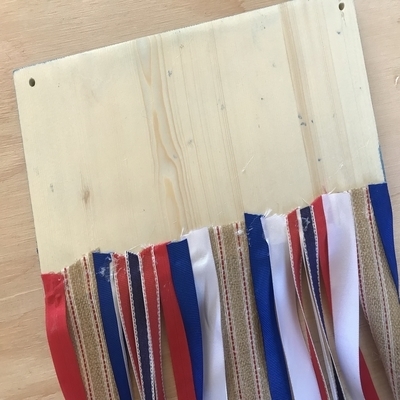 Turn your board over and start hot gluing the ribbon strips to the bottom of the board. Sporadically place them in whichever pattern looks good to you. 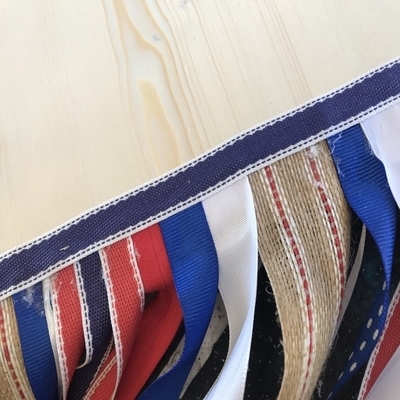 When you are done, you can glue one final strip of ribbon all across the top to “finish” and seal the back. 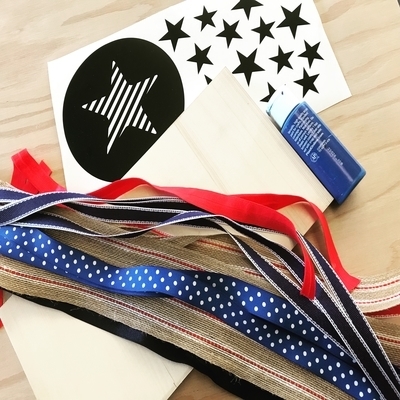 Tie a piece of remaining ribbon through the holes at the top of the board and your Stars and Stripes Door Hanger is ready to display! I use command strips to hang things in my front door simply because they don’t mess with the finish or paint and they’re easy to remove! These command strips are my lifesavers when it comes to decorating and changing things out for the seasons and holidays! This is a project that can be changed to match lots of holidays and seasons! 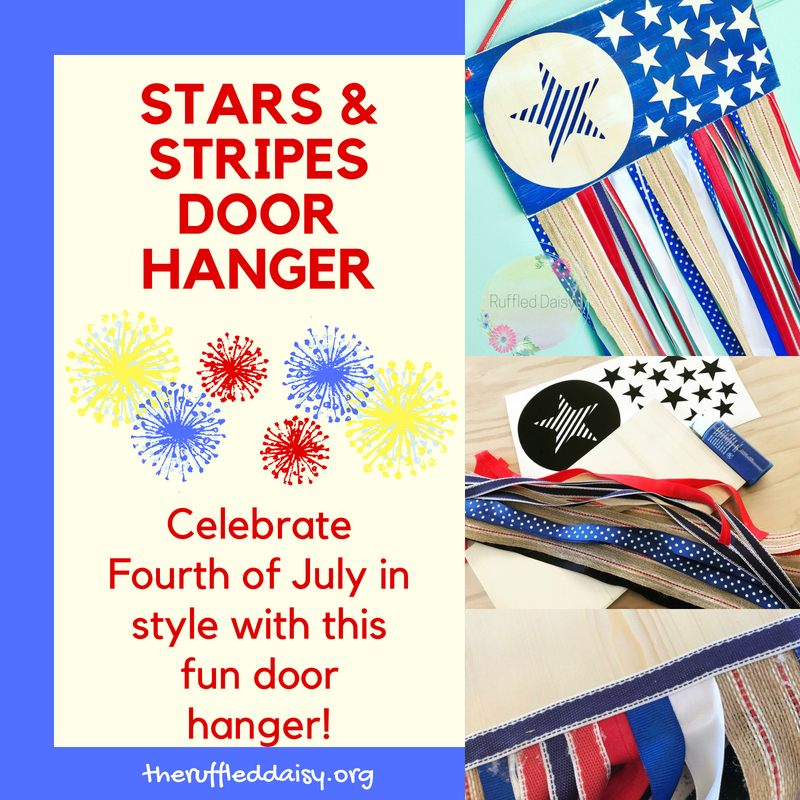 I just LOVE how the Stars and Stripes Door Hanger looks like a flag with the hanging ribbons! 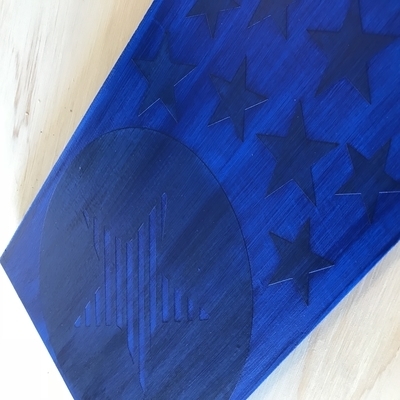 What are you working on this year for the 4th of July? Do you tend to go all out in decorating or do you place a few things around the house and call it good? 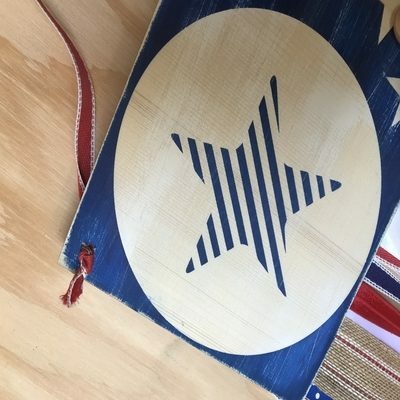 Take some time this holiday in between your decorating and crafting to appreciate the independence that we have as a country that we all too often take for granted! Happy 4th of July to all of you!!! What a fun craft idea! I bet my teenager would love to make something like this. That’s such a cute craft idea! I love how it turned out. One of my friends and I do a monthly craft night and last year we made red, white, and blue rag wreaths for our front doors. This is such a cute and crafty idea. I love it!! I’ll have to try this next year. Such a fun craft! Hope you have a wonderful 4th of July! This is so cute! Would be a perfect decoration for the lake house! !